In 2017 André celebrates a very special anniversary: Exactly 30 years ago, in 1987 he founded his Johann Strauss Orchestra! And of course he starts the new year in a very special way: with festive New Year’s Concerts in Amsterdam and Brussels, which will become a tradition. The concerts are followed by a huge and widely acclaimed 24-city-tour through all of Germany, the highlight being the midnight guest star at the Semper Opera Ball in Dresden, which also marks André’s first performance at a Ball. Thousands of guests joyfully waltz the night away to the most beautiful waltzes handpicked by André. In March he returns to the UK to play concerts in London, Manchester, Birmingham, Nottingham and Glasgow, and continues his world tour through France. In the spring of 2017 André performs in many of his beloved cities and countries, such as Prague, Salzburg, Vienna, Zagreb and Budapest as well as concerts in Poland and Denmark. He also records his new album: AMORE, which is released in the fall of 2017 and immediately hits the UK Pop Charts again. In July André celebrates the 30th Anniversary on the Vrijthof with 10 wonderful concerts, which are brought to cinemas all over the world by satellite, hitting a new viewership record. 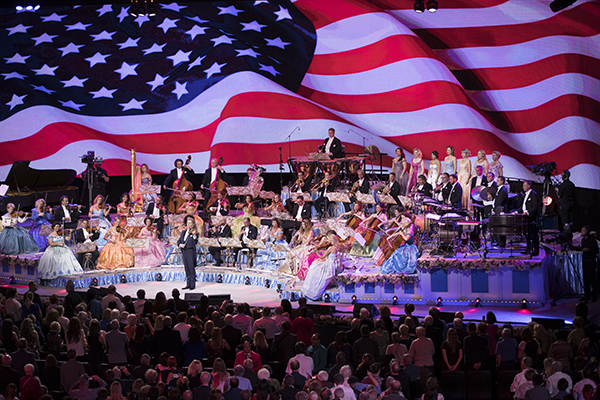 The magical spectacle is captured on the DVD “André Rieu – The Magic of Maastricht – 30 Years Johann Strauss Orchestra”, and is released in the fall of 2017. As icing on the cake, David Hasselhoff joins André on stage and goes through the roof with Looking for Freedom, Love Me Tender and Paloma Blanca! After their annual summer break André and the orchestra return to Chile for four sold out concerts and to Mexico. Deeply touched by the earthquake, André decides to perform in Guadalajara and Monterrey and to postpone his Mexico City concerts to March 2018. October and November marks a long awaited return to the United States. The first leg of his US tour takes André to the West Coast. His new album “Shall We Dance” is released in the U.S.
André and the whole orchestra finish off the year 2017 with their traditional series of magical Christmas Concerts in the UK and Ireland in December and return to Maastricht on the 24th December to celebrate Christmas with their families.